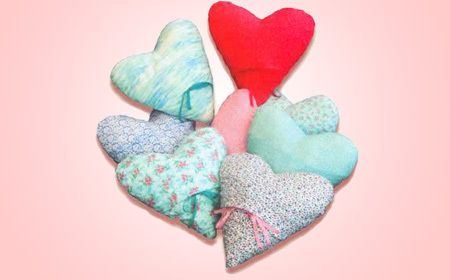 Norfolk Quilters began making these small heart-shaped support cushions on 14th February 2004, for ladies who have experienced breast cancer. The response has been overwhelming. At the start of 2005, the known total of cushions made and given away by Norfolk Quilters had exceeded 200. Of course, in reality, many more have been sewn by members for friends and relatives. We are constantly being told that it is not merely the cushion itself which provides some comfort, it is the knowledge that someone has taken time to create such a gift and given it freely. Time and again remarks such as “someone has thought about us“, “what a lovely idea” and “thank you for thinking about us” are passed to our members. Norfolk Quilters are finding that ladies who have had treatment as long as ten years ago still find the hearts to be beneficial, so we make and give them to any lady who has experienced breast cancer, regardless of how long ago or the level of treatment. They are given free. If you would like to make and donate one of or some of these hearts below are the ‘how to‘ instructions and if you contact Pat Lowe (email: tricialnq@aol.com – please make the subject Heart Cushions; Mob: 07930 917343 she will be happy to deliver them). Read more about how to make these Heart Cushions. The original design was from an article by Maggie Martin published in Patchwork & Quilting magazine, Oct 2003 – you can of course consider the pocket and ribbons optional, although a scented sachet is a very nice, thoughtful extra which is appreciated. However, if you are making these cushions for a hospital or GP surgery, do check they wish to have the sachets included. Norfolk Quilters use various quilting techniques for the front of the cushion, with crazy patchwork embellished with embroidery stitches being very popular, but there are so many techniques to choose from. 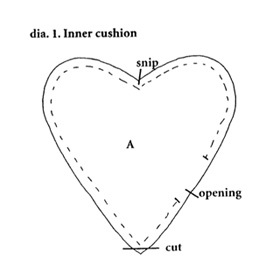 You can, of course, just make a simple heart in pretty cotton fabric. Your gift will be appreciated however you make it. For the cushion pad, the stuffing from a new pillow is ideal; one pillow will make up to three cushions, depending on the pillow. Generally, make the cushion pads to a medium firmness, soft enough to be comfortable but firm enough to give some support. May you have pleasure in making and giving these cushions. If you would like further information, advice or help in relation to breast cancer, visit – www.macmillan.org.uk. Recently I asked for heart cushions as a matter of urgency for the N&N University Hospital Big C Centre in Norwich. My local group from Stamford made 25 on our Charity Saturday in March and I delivered them soon afterwards. Chet Valley also made a fair few and I delivered those as well. Since then I know that two people have delivered about another ten direct to the Big C Centre as they rang me and asked how to get them there and they were happy to take them. I also have six in my house in Norwich given to me by Jennifer Huish. So the urgency is no longer there but PLEASE would you continue to make them and let me have them so I can deliver them throughout the year? Below there are two thank you letters, one from the Manager of the Big C Centre and one from a breast cancer patient. I am sure that after reading these you will feel inspired to make more cushions for them to hand out or use. Many of you know I am a football fan and, as I write this, Rio Ferdinand (a former England player) has just lost his 34 year old wife to breast cancer. They have three young children. Please let us continue to give comfort and support to all those who suffer this awful disease. The pattern is now on the website with making instructions for those who have not made one before. Please have a look and have a go. Again I send my heartfelt thanks to those who answered the call. You are gems. Jill Chapman, Manager of the Big C Centre at NNUH, wants to pass on her grateful thanks for all the heart-shaped cushions you have all made in the past. She said “ladies find them really helpful to support underarm if they have had breast surgery and lymph nodes removed, and also to cushion the seat belt in the car. Some ladies say they would not have had a night’s sleep without their cushions”. We are always keen to keep our stocks up, though storage can be limiting, but we are always grateful for a top-up supply. To the lady who made my pink heart cushion. Hello, my name is Carolyn and I have not met you. I felt that I wanted to send you a huge “thank you” for making the cushion. I was introduced to your beautiful cushion in November 2014 on the day of my surgery and told that it was made by a lady whose daughter had cancer and it would be useful for putting under my arm after the operation. The pink cushion has been invaluable to me as there have been times when I have been and still am very sore and the cushion is there for me. It has now been several weeks since my surgery and I was given the “all clear” in December 2014. I am now having Radiotherapy, this started in February and finishes in March 2015. The cushion has been needed again. I am hoping that after this treatment I can then say I have done all I could to combat the breast cancer. I do not know who you are, however I would like to send my “heartfelt’ thanks again and wish you all the very best.